This is Emily Maben of Penhaligon's, who we worked with to create the Moustache Collection. Doesn't she look fabulous? We had a chat with Emily about Sartorial and the Moustache Collection... Can you tell us a bit about Penhaligons, Emily? So much to tell! 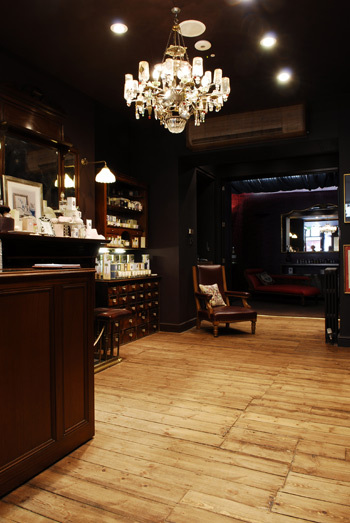 Penhaligon’s was founded in 1870 by a chap called William Penhaligon, who hailed from Cornwall. In the late 1860s he moved to London and worked in a barbershop on Jermyn Street, next door to the Piccadilly Turkish Baths. A few years later he took over the barbershop and started creating lotions, fragrances and other tinctures for his clients. One of his first fragrances Hammam Bouquet was created in 1872 and was inspired by the scent of the baths next door to his shop! Hammam Bouquet is still sold in our boutiques today! Today, we strive to work in the same way as our founder; taking inspiration from people, places, art, our travels. It’s important to us that our perfumers have complete creative freedom, so we never give them a traditional brief, or a budget to work to. We try not to restrict their creativity at all and the end result is always much more interesting that way! What do you do at Penhaligons? I’m Head of Marketing; so I’m responsible for lots of different areas; coming up with ideas for new fragrances and products, creating schemes for our windows, looking after PR, running our website, and loads more. It’s a small team (three of us) and we work very creatively and love to collaborate with like-minded brands and artists! How did the Sartorial fragrance come about? A visit to a tailors on Savile Row! I popped into Norton & Sons to borrow some suits for a photoshoot and was instantly struck by the aromas wafting from the workroom. Though they were subtle scents, something just clicked and I knew instantly that we needed to create a fragrance that captured the atmosphere of the workroom. Luckily, our CEO Sarah agreed and Sartorial was born! I then took the perfumer Bertrand Duchaufour to the workroom and we spent a couple of hours sniffing pretty much everything in sight – we steamed lots of different fabrics, opened up the sewing machines, shut ourselves in the pattern cupboard, and took away leather scraps and pieces of beeswax and tailors chalk. It was fascinating to see a perfumer like Bertrand in his element, scribbling ideas on post-it notes and hugging bundles of tweed! We didn’t visit any other tailors...we wanted to capture the unique scent of this one workroom! Can you tell us a bit more about Bertrand, and how you came to work with him? Bertrand is a fascinating and inspiring man. Above all things he is an artist; in the field of perfumery, but also as a painter and photographer. His travels have inspired many of his creations including Timbuktu and Dzongkha for our sister brand L’Artisan Parfumeur. Bertrand has worked with them for a number of years, and that’s how we found him! This is the third fragrance he has created for Penhaligon’s, the first was Amaranthine, a powerful, tropical floral with a certain amount of naughtiness. Then he created Orange Blossom, which has quickly become one of our bestselling fragrances and now Sartorial. For a fragrance obsessive like me, he’s a dream to work with, I am always blown away by his creations and love the fact that he teases me for my love of powdery vintage style scents! How did you come up with the idea of a Tatty Devine collaboration? I’ve been a massive Tatty Devine fan for years after stumbling across the old Brewer Street shop in Soho when I was a student. Since then I have built up quite a collection, to the point that I have to write in silver pen on the boxes or it takes forever to find what I am looking for! 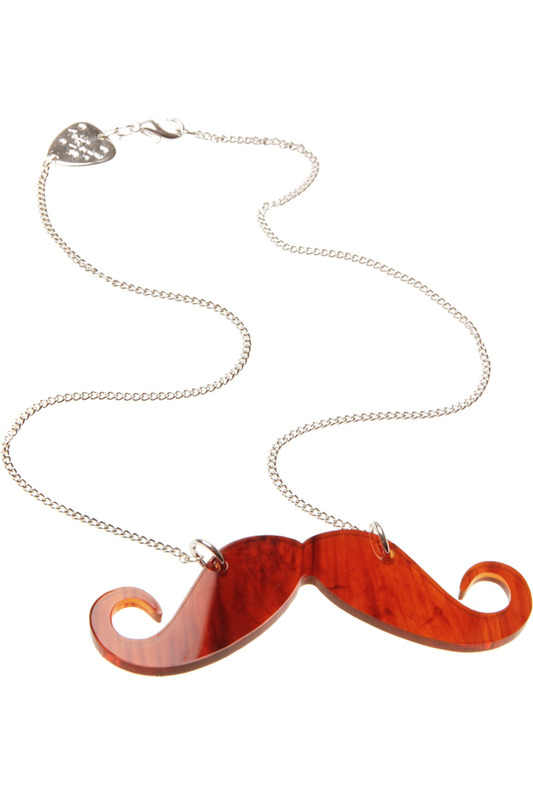 As soon as I started working on the Sartorial project I knew I wanted to create some accompanying accessories and it didn’t take me long to remember the classic Tatty Devine Moustache Necklace! Then I met Rosie in the Brick Lane shop (buying more things! ), told her the concept and to my delight she and Harriet loved the idea and created this wonderful collection especially for Penhaligon’s! Visiting the Tatty Devine workshop was a great experience, but I found it hard to concentrate with so much exciting stuff to look at! 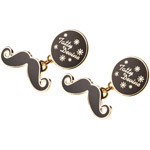 What kind of gentleman would enjoy wearing Sartorial, and the Moustache Collection? Sartorial is a fragrance for a new generation of gentlemen. It has classic roots but with a modern edge which we hope will appeal to men of all ages. It also seems to make women go a bit weak at the knees! The perfect wearer would be disarmingly handsome, charming with it, but with just a whiff of danger about him! 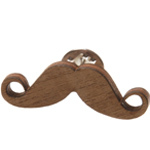 The Moustache jewellery I think will have the same appeal... I can just imagine the little tie-pin on an older gent with classic style, while a younger chap can wear the wooden necklace with a buttoned-up shirt and braces. Personally I will be wearing the tortoiseshell necklace with a high-collared blouse and pinning the brooch onto one of my many hats! Thanks Emily! Now it's your turn - let us know what you think of the collection and the fragrance.